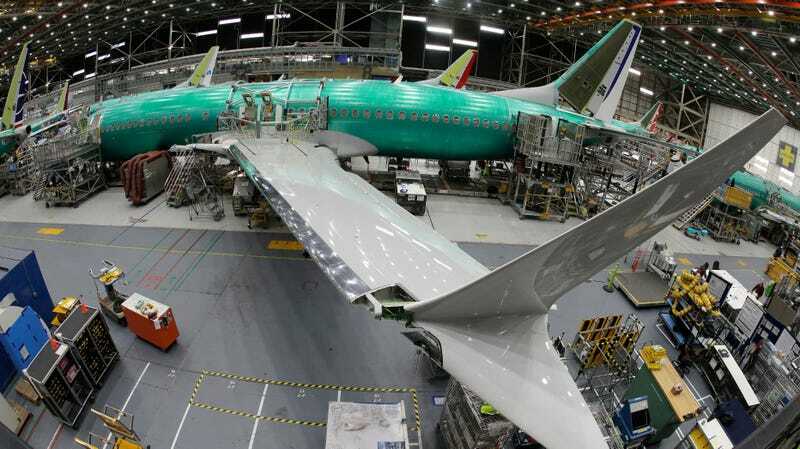 A Boeing 737 MAX 8 jet being assembled at a company facility in Renton, Washington, on March 27, 2019. Countries the world over grounded 737 Max jets after two catastrophic crashes, a Lion Air flight that dove into the Java Sea near Indonesia in late October 2018 and an Ethiopian Airlines crash near Ethiopian capital Addis Ababa in early March 2019, killed all 346 passengers and crew on them. Both crashes are believed to be linked to an automated flight stabilization system called the Maneuvering Characteristics Augmentation System (MCAS). Designed to alleviate potential stalling issues that could potentially arise from the 737 Max’s updated engine layout, MCAS automatically lowers the nose of the aircraft to compensate when it concludes it must do so. As the New York Times wrote, some flight crews appear to have been unready for a specific malfunction: “Faulty data erroneously indicating that the plane was flying at a dangerous angle, leading the flight control system to repeatedly push the plane’s nose down.” According to the Dallas Morning News, several pilots have reported getting caught in sudden descents when MCAS automatically activated. A Boeing official who spoke with the Journal instead characterized the delays in rolling out a fix, which was developed in partnership with regulators and suppliers, as made out of an abundance of caution. The delay leaves two dozen Max 8 airplanes operating for American Airlines, 34 Max 8 jets operating for Southwest, and 14 of the larger Max 9 jets flying with United Airlines out of commission, according to CNN.